If you choose steel gutters over aluminum, learning about coatings is still important. Chances are you’ve heard about “galvanized” steel. But galvanization is not just one process. Many formulations are possible. For example, one of the leading steel coatings today is called Galvalume® which employs a mix of aluminum and zinc. In general, though, modern hot-dip galvanizing is a process whereby steel is immersed in molten zinc, which bonds to form an alloy gutter coating that protects the steel from rust. If you’re building an upscale custom home and thinking about copper or zinc gutters, keep two things in mind. First, copper and zinc naturally develop their own protective gutter coatings as the metals patina over time. 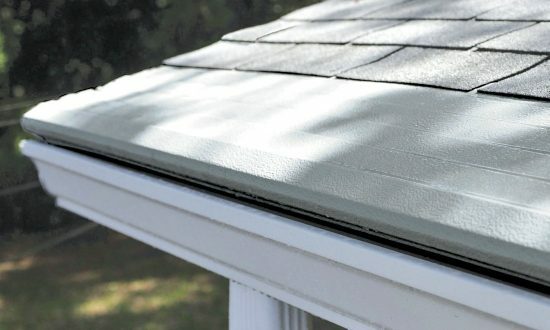 (Some manufacturers even offer “pre-weathered” copper and zinc gutters.) Second, lead has been used to coat some architectural copper for more than a century. Lead alters the color so that copper runoff does not noticeably stain stucco, masonry, limestone, and other light-colored building materials. However, many jurisdictions now see lead-coated copper runoff as an environmental threat.